Not content with the wide range of Android tablets on the market today? 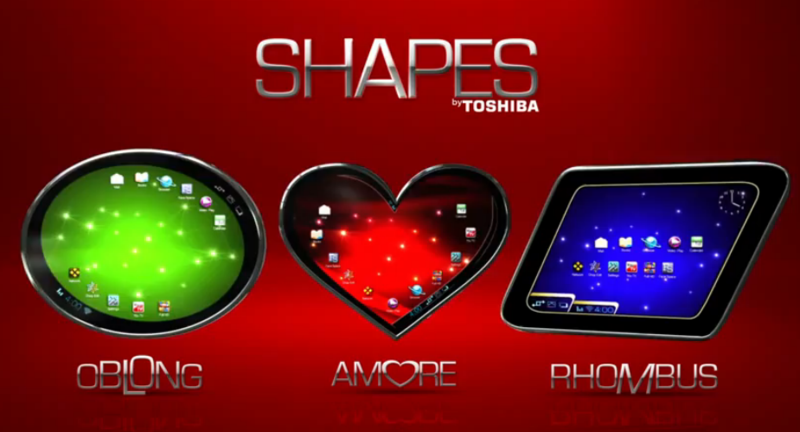 Toshiba may be able to answer your prayers, with the announcement of tablets in three new form factors. The Oblong, Amore and Rhombus slates will hit the market soon, and the unveil video can be seen below. I loathe Android for many reasons. I can’t help it, and I apologise for that. I have my reasons, and I believe they are valid, so here we go. The Dell Streak 7 was recently discontinued and, like a certain other tablet, this action is a cue for price cuts. It has now hit the low low price of £99.97 at PC World which will get you a Tegra 2 powered slab with an 800 x 480 resolution and, while sporting Froyo out of the box, an official update to Android 3.2 ie. Honeycomb is available over the air. It is unlikely that you will ever see Ice Cream Sandwich officially on this but, at this price, you may as well give it a go. The deal is in store only so head on over to your local PC World to grab this bargain.